Today I will be doing my first lip balm review. All of us definitely have more than one lip balm in our stash because it is one of the essential lip care items. I have a bad habit of biting my lips and as a result I have dry lips throughout the year. So, I always prefer smearing a lip balm so that it stays in proper condition. This lip balm from Maybelline has undoubtedly served most of my lips problem. It is Neon Rose shade from Maybelline Baby Lips range. Read ahead to find out the reasons why I love it so much. Introducing Maybelline Baby Lips New Bright Collection. Pamper your lips with bright colors and continuous moisture. Available in 3 attractive shades. No more basic lip balm. The next generation of lip balm is born, from Maybelline New York. Adult strength care for baby soft lips in vibrant translucent colors. It is infused with "pure color system" for a translucent bright of color and shine. 6 Hours continuous moisture formula with vitamin E and jojoba oil helps to shed away rough dryness for supple smooth and cushioned lips all day. 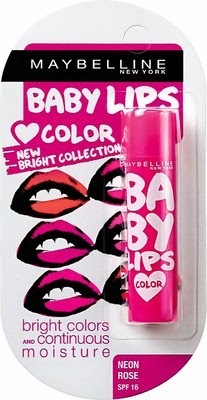 Packaging: The packaging of Maybelline Baby Lips Neon Rose is the cutest I have ever seen. Believe me, you will surely fall in love with its cute packaging. The product comes in pink cylindrical plastic stick with a pink cap. The lip balm is retractable one without any fuss. The packaging is very travel friendly as I always carry this cute item in my bag all the time. Shade & Texture: The shade is a tinted rose color with a glossy finish. It happily moisturizes the lips throughout the day. The tinted color won't show up on pigmented lips though. The texture is completely buttery and glides on my lips very smoothly. Baby lips are the best lip balms ever and there is no doubt about it. This particular variant moisturizes the lips and keeps it flake free for about 4-5 hours, when applied heavily. After that I feel the need to re-apply it again. It tastes very much like strawberry. Not only it will moisturize the lips but also enhances the skin making the lips extremely soft. The SPF is a very important factor in this lip balm as I can easily step out after applying this product on my lips. Overall, I am extremely happy with this lip balm. Very cute and girly packaging. It is a beautiful tinted rose color. Provides light color to bare lips. The texture is extremely smooth and buttery. Keep the lips moisturized for a long time. This particular lip balm is extremely cute and I always carry it in my bag all the time. It keeps my lips moisturized and soft for a long time. It has been long that I started using this shade and will surely buy two or three more other variants. I surely recommend this lip balm to all the ladies out there as there is really no other brand which gives such amazing results. I love baby lips too...they are all so good with the lips. These tinted ones are lovely...I recently bought new range pink quartz. Even that is superb! really? do give us the review soon Lavanya. would love to buy that too.